I have been been using a couple Ardunio Nano boards to develop code, and test at pin level with a Saleae 8 LA. I am now on a hurry to prototype hardware for additional testing. 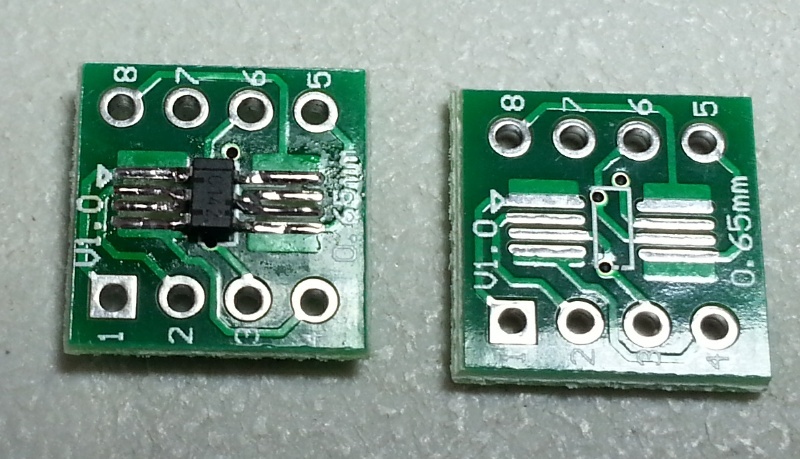 I had on hand a dual Schmitt trigger in a SOT23-6 package, but wanted a DIP. I purchased a few PCB adapter boards awhile back. I found a dual sided 8 pin SOP/TSOP adapter, and it was possible to mount the SOT23-6 on the TSOP side, with pins 2,3 shorted and pins 6,7 shorted. On the SOP the pins 2,3 and 6,7 were used to mount a 1206 bypass capacitor. The 31456 PB prototype PCB was from Marlin P Jones: http://www.mpja.com/Protoboards/products/284/ They have many more other ones too. My technique is to tag the part into place ensuring alignment is correct. The using flux gel, place some on the pins, then drag a blob of solder. Clean up with soderwick if required and flux cleaner. Pretty slick! My technique only allows SMD parts on one side. Well, I do hand solder big d-pack fets on the opposite side after I put the rest on the top.